"Mormon Underwear" is a derogatory nickname for the Holy Temple Garment worn by temple-attending members of The Church of Jesus Christ of Latter-day Saints. The formal name of the temple garment is "the Garment of the Holy Priesthood." It is similar in meaning to the talit katan worn by Jews. The Jewish undergarment has knotted tassels at the lower hem, with 613 knots representing the Mosaic laws. The Mormon undergarment has four tiny sewn-in symbols representing one's followership of Jesus Christ and that one should live righteously. Some people snidely refer to the Mormon garment as "magic underwear," because the Mormon temple garment is "protective." The protection inferred in the wearing of "Mormon underwear" is, however, spiritual. As a reminder of temple covenants, which are covenants to live righteously and keep God's commandments, "Mormon underwear" help Mormons build a spiritual "hedge" to keep out the "destroyer" — Satan. Satan only has power over us to the extent that we invite him into our lives. Garments for women also come in bottoms and tops in various fabrics and styles. Again, they are always white. The neckline of the tops follows the typical bra-line, but there are cap-sleeves on all styles. Thus, a woman who has been endowed in the temple will not wear sleeveless dresses or blouses. Garment bottoms usually come to the knee, but there are longer bottoms to wear under long pants, if desired. Thus, a Mormon woman who has been through the temple will not wear shorts or mini-skirts. "Mormon underwear" is not to be altered to suit the styles of the day. The cut of Mormon temple garments has changed over the years, however, just for that reason — in pioneer times, temple garments had long sleeves and longer legs. Temple Garments as "the Armor of God"
This garment, worn day and night, serves three important purposes: it is a reminder of the sacred covenants made with the Lord in His holy house, a protective covering for the body, and a symbol of the modesty of dress and living that should characterize the lives of all the humble followers of Christ. The piece of armor called the temple garment not only provides the comfort and warmth of a cloth covering, it also strengthens the wearer to resist temptation, fend off evil influences, and stand firmly for the right. Of one choice group of believers, it is written, “Thou hast a few names even in Sardis which have not defiled their garments; and they shall walk with me in white: for they are worthy. “He that overcometh, the same shall be clothed in white raiment; and I will not blot out his name out of the book of life, but I will confess his name before my Father, and before his angels” (Rev. 3:4–5). How wonderful it would be if all Church members walked with God in white and were numbered with the Saints in Sardis! The scriptures contain many references to the wearing of special garments by the ancients. Prior to their expulsion from the Garden of Eden, Adam and Eve were clad in sacred clothing. We read: “Unto Adam also and to his wife did the Lord God make coats of skins, and clothed them” (Gen. 3:21). Members of the Mormon Church cringe when the sacred temple garment is held in derision. Most members have never heard deriding comments about the religious vestments of other faiths, probably because no one derides them, out of respect. Again, what is disrespectful when done to friends of other faiths, seems to be tolerated when the criticism is aimed at Mormons. Mormons request some respect of their sacred and holy worship, and the vestments required for that holy worship. 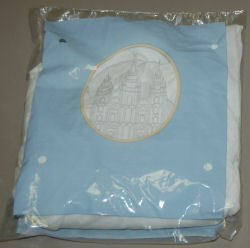 They request that you refrain from calling Mormon temple garments "Mormon underwear." Now that you have read this article, you will know better, and you can gently correct your friends. Please also help others understand that nothing impure goes on in Mormon temples. A Mormon temple is a house of God, a place of light and truth. This page was last edited on 16 November 2017, at 14:21.